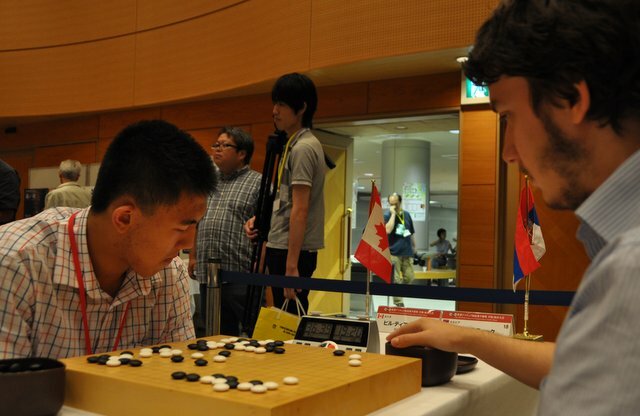 After two days and four rounds at the 34th World Amateur Go Championship in Sendai, Japan, just four of the 62 players are undefeated: Yuqing Hu of China, Korea’s Hyunjae Choi, Kikou Emura of Japan and… Canada’s teenaged Bill Lin (at left in photo), who drew down in the fourth round but still faced a stiff challenge from Slovakia’s Pavol Lisy. Top players with 3-1 records include Chinese Taipei’s Shin-Wei Lin, Russia’s Ilya Shikshin, Artem Kachanovskyi of Ukraine, France’s Thomas Debarre, Csaba Mero of Hungary, the Netherlands’ Merlijn Kuin and Cornel Burzo of Romania. Curtis Tang of the U.S. is 2-2 after the tough draw of Chinese Taipei in the fourth round. Tuesday’s 5th-round pairings include China-Japan, Korea-Canada, France-Ukraine and U.S.-Singapore. Click here for full results; here for selected game records and here for the player roster. Four matches are broadcast each round on Pandanet and WBaduk.